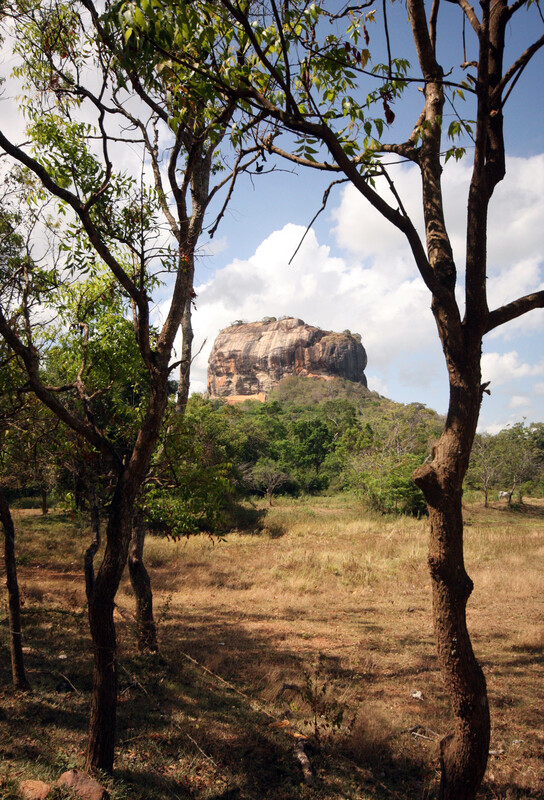 It’s hard not to like Sigirya rock, and I think much of this is due to its setting in the middle of the jungle, surrounded by crocodiles, monkeys, birds, lizards and wild elephants. It still feels quite raw and undeveloped here, and the rock itself is genuinely impressive, especially when lit up by the afternoon sun. Entrance is included in the Cultural Triangle round ticket, or you can buy a single entrance ticket for $25. The rock is the hardened magma plug of an extinct volcano that long ago eroded away, which I already found quite awe-inspiring, just imagining the time scales involved. Nobody is entirely sure what the constructions on top of the rock were used for, but one theory is that they’re the remains of a royal palace and fortress built by King Kassapa during his reign from AD 477-495. 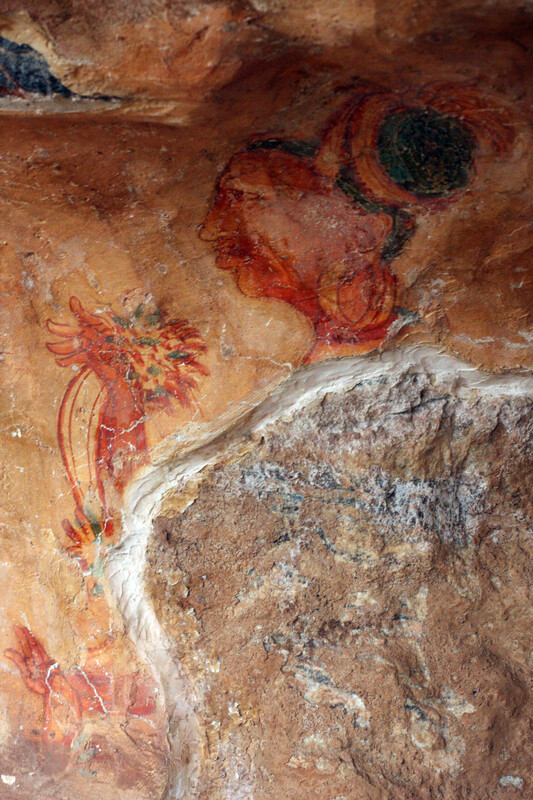 The intriguing frescoes of women painted halfway up the rock are then reputed to be pictures of some of the King’s concubines. The other main theory suggests that the rock was actually a Buddhist monastery, built long before the time of King Kassapa. It is fairly certain that Buddhist monastic settlements were established here in the 3rd century BC. The female forms could then be aspects of Tara, a bodhisattva important in Tantric Buddhism. This explanation of the frescoes doesn’t seem right to me, having seen the pictures of the women. They include one African lady and I’ve never seen Tara portrayed as African anywhere else. 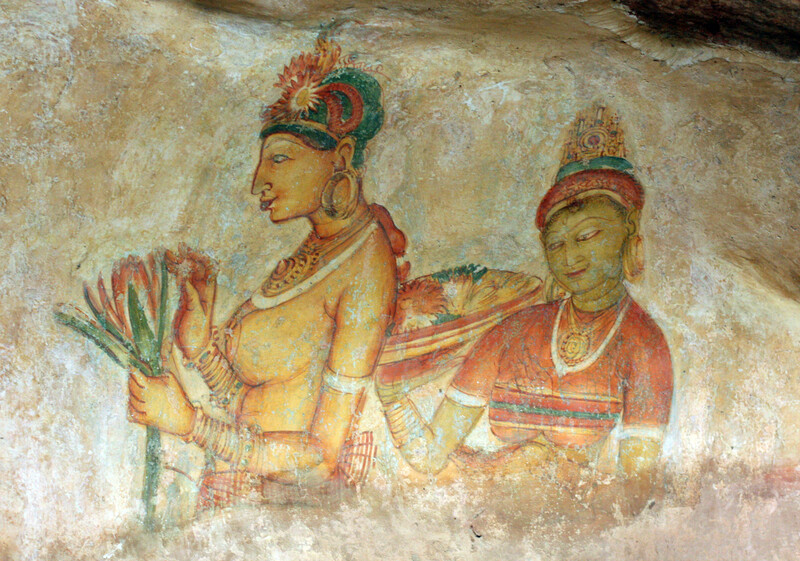 I’m more persuaded that they’re paintings of apsaras (celestial nymphs), but why couldn’t they just be idealised images of women? The painting style is modern and fluid and they look like the work of a dreamy art student, albeit one with amazing natural talent. They’re protected from the sun by a tarpaulin and are in remarkably good condition. You cross a moat then walk through some lovely landscaped gardens to reach the rock, where you climb up a set of stone stairs. Just beyond the fresco gallery is the mirror wall, so named because it was once coated in a smooth glaze that shines when the sun reflects off it. Onto this wall visitors of 1000 years ago scribbled their impressions of the women in the frescoes, among other things, and the translations of some of these scribbles are like a message from the past. Beyond the mirror wall is a large platform and here a final set of stairs leads up the summit, between two giant, impressive stone lion paws. The rest of the lion has sadly eroded away. There are magnificent views from the summit, of a landscape that seems to come from a 19th century Romantic painting. 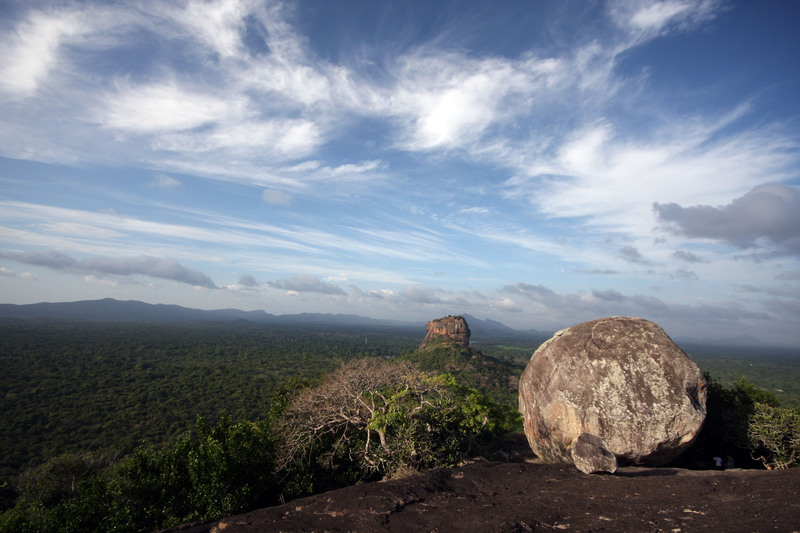 Neither of my guidebooks (including the Lonely Planet) mentioned this place, but it was one of the most special places I visited in Sri Lanka, perhaps partly for the feeling of discovering somewhere for myself. I saw the sign to the temple at the entrance to Sigiriya rock, and very early next morning, at about 5.45am, I went to have a look. 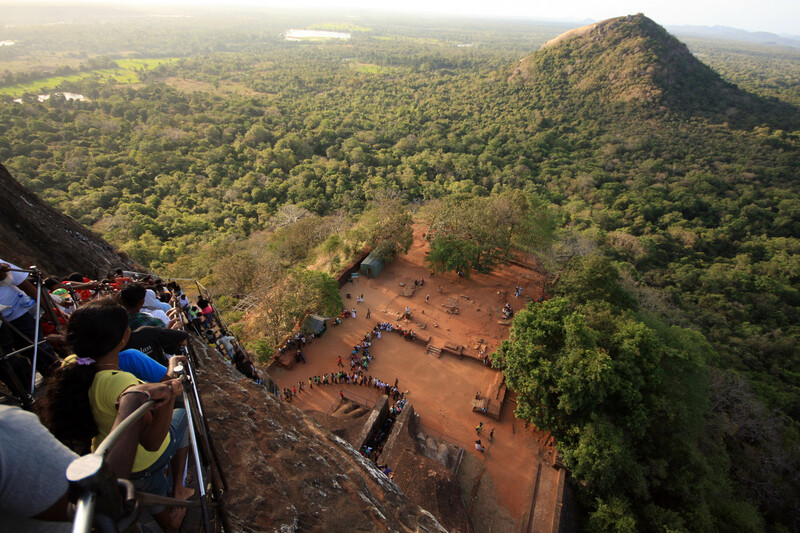 Thus suitably terrified, I walked around Sigiriya rock next to the moat, looking about me for wild animals appearing out of the bush, and finally a little disappointed when none appeared, not even a monkey. I passed a few houses before I reached the temple, and the inhabitants were already awake and going about their business in the early morning cool. The sun had only just appeared. I had imagined that the temple was at the base of a cliff, but when I reached the area the signs pointed to a path heading up between the rocks; so I followed it up, and up. After a sweaty climb, almost to the very top of the hill, I came to the temple. There was simply some sacred writing carved into the rock, surrounded by a railing, and a large reclining Buddha sculpture carved out of the cliff, but it was incredibly peaceful. The low morning sunlight was golden and fell full onto the sculpture, illuminating it beautifully, and there was an excellent view of the countryside below. I thought I might try to meditate for a while, but at this point two white men appeared, one wearing the orange robes of a monk, and they passed by me telling me they were heading to the summit. Curses! I wonder if I’d gone on to climb the final stage if these people hadn’t come along, seeing as I didn’t know it was accessible, but I like to think I’d have followed my nose. Whatever, I sprang off after them and bounded to the top. You have to leap between big stones and then make a precarious final ascent up a steep boulder, but you emerge onto an enormous flat piece of rock and it’s like standing on the roof of the world. A feeling of wonder came over me as I walked around on top of that rock in the early morning glow. 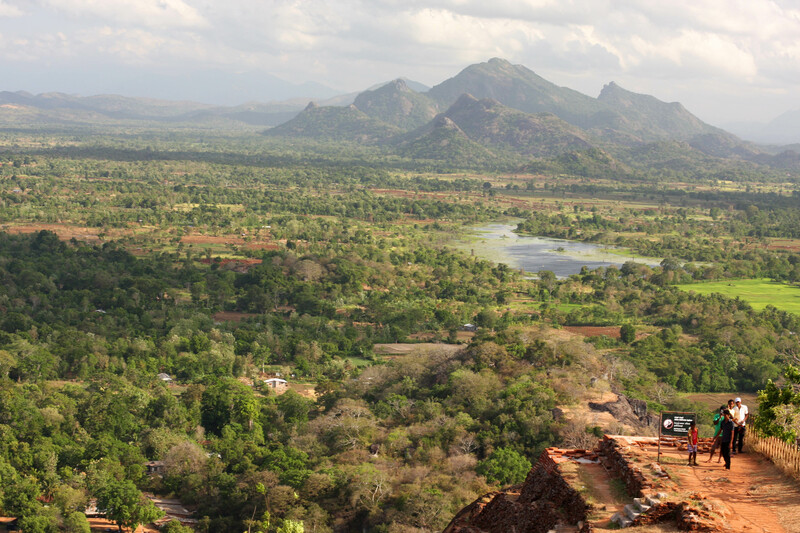 This was even better than Sigiriya because it was personal – I’d almost discovered it and it felt like mine. 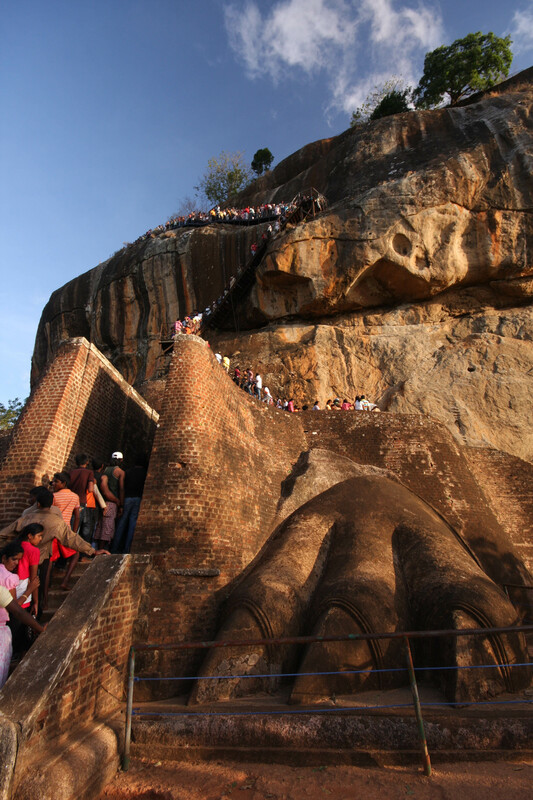 The views were glorious and Sigiriya rock looked stunning. I took a lot of photos. Yet from Sigiriya I’d hardly taken notice of this large hill, so close by. I stayed up there a long time – over an hour, until the golden light was gone. Accommodation The Flower Inn (066 5672197) is very relaxed, and surrounded by flowers. There was a bit more wildlife in the bathroom than I wanted, including frogs in the toilet and giant cockroaches hiding behind the door, but that is probably true everywhere around here. I was woken up my second night by monkeys running over the roof. The nearby Nilmini Lodge is reputed to have excellent food. For a splurge stay in Jetwing Vil Uyana, www.jetwinghotels.com/jetwingviluyana/, a luxury hotel resort half hidden in the jungle. There is a resident naturalist who can take you for safaris very early in the morning, so you are in the forest to see and hear the wildlife waking up. Eating in Sigiriya Most people eat in their guest house, but I ate several truly delicious meals in the Ahinsa Restaurant, in the centre of the tiny village on the south side of the rock. This is basically just a fruit and vegetable stall, but the couple who run have it recently began cooking made to order meals using fresh ingredients. Try a breakfast of hot, home-made dahl, string hoppers, a mixed fruit juice and a pot of local coffee. Yum!